In this post, we'd like to focus on Microsoft 365 Business and discuss its benefits for small to medium-sized companies. The tools you get with a Microsoft 365 subscription are Office 365, Windows 10 and Enterprise Mobility + Security. The business version was designed and packaged by Microsoft to be the complete, integrated solution for SMB's. How does it accomplish this? How does Microsoft 365 Business increase productivity? MS365 Business allows you to work from anywhere and securely access tools like Excel, Word, PowerPoint, and files in your OneDrive on a laptop, tablet, or mobile device. All of your data stays in sync with the convenient 1 TB of cloud storage through OneDrive. This allows for the easy sharing of information and better collaboration. How does Microsoft 365 Business help people work better together? It gives you business-class email with shared calendars and a focused inbox. 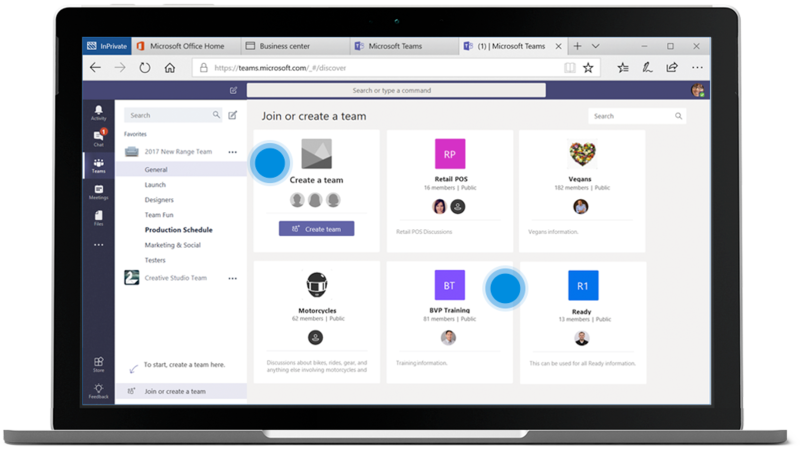 It also allows you to create useful and interactive intranet sites via the modern SharePoint and it moves meetings, video conferences and conversations to Microsoft Teams (the fastest-growing communication and collaboration app in the world). When you can meet from anywhere, organize specialized groups within your org, and give the right people permissions and access to vital information - company efficiency goes way up. How does Microsoft 365 help a business grow? Because it's an all-in-one bundle of tools and services, it takes the stress out of adding new users and keeping everyone connected. This also simplifies costs and makes keeping track of tech budgeting simpler (see pricing chart below). 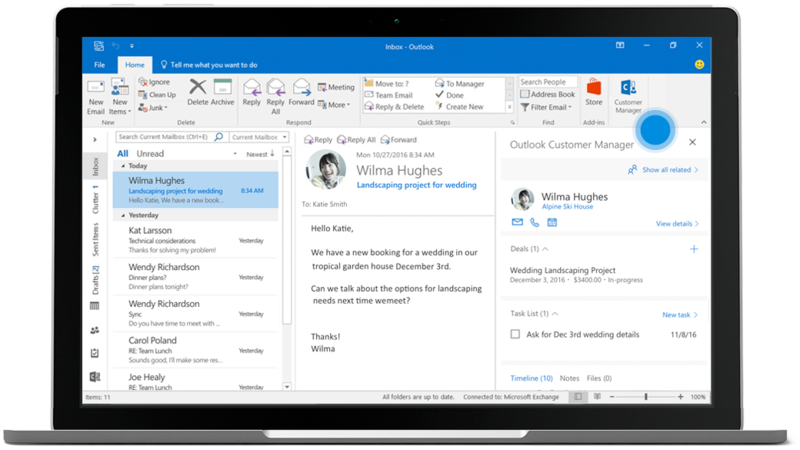 Through Outlook and other connected tools, Microsoft 365 offers solutions for tracking customers, booking appointments, accepting payments, engaging your workforce, and tracking your daily usage and work habits. Why is data security such a focus of Microsoft 365? Protecting against threats should be a main focus of any business application today. Microsoft 365 does this by offering advanced threat protection, safe attachments, real-time link scanning, and warnings about malicious sites and downloads. You can also further protect company data by restricting copying and saving on personal devices, managing when and how mobile devices are used, and setting authorizations and permissions on sensitive company files. Is Microsoft 365 difficult to set-up? Because of its integrated nature, MS365 is much easier to deploy than trying to use several different programs and solutions that aren't already designed to sync together. When a new user connects a Windows 10 device to your organization, they'll automatically receive the settings you configure and cannot over-ride them. Consistency saves a business time and money. This is probably one of the biggest benefits of using Microsoft 365 inside your organization. 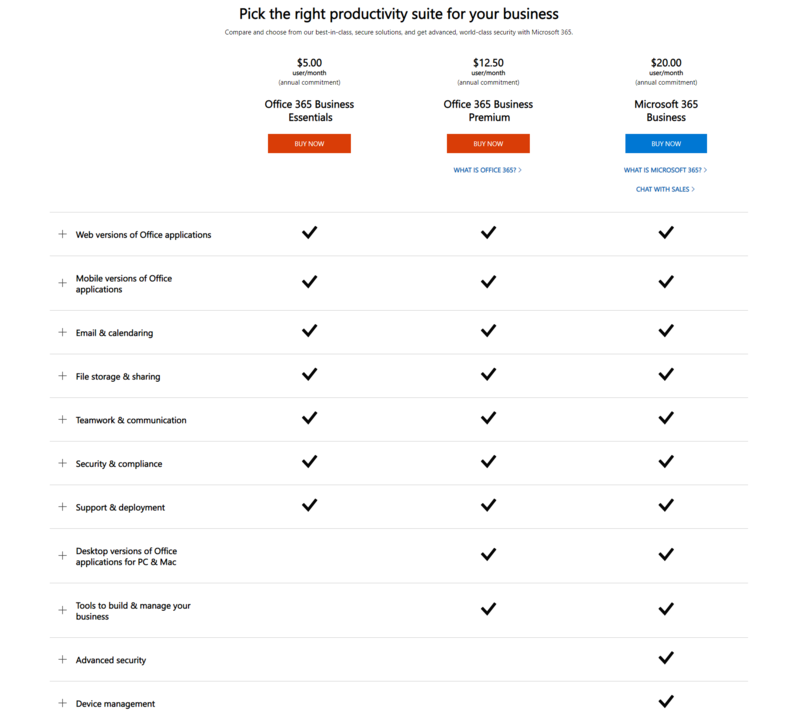 Here's a breakdown of the pricing tiers for MS 365 Business with what you get at each level. We are happy to discuss your options and make suggestions based on your specific business needs. Also, depending on your industry and organization, there may be additional security measures you will want to have in place. If you're running a small to mid-size business and are tired of unsecure and scattered data solutions, or realize your organization could benefit from more tech consistency, consult with our experts today to find out how to start using Microsoft 365.